Doctors often misdiagnose pes anserinus tendinitis as a medial meniscus tear or strain, so if your doctor says you have MCL, consider getting a second opinion. Both conditions cause pain in the inner knee. Pes anserinus tendinitis is an inflammation in the three tendons that connect between the shinbone and thigh muscles to become the pes anserinus tendon. Overuse of the knee, such as from running or sports that involve jumping, is usually the cause. However, when these tendons and the hamstrings muscles are strong they take pressure off the pes anserinus tendon and overuse will not occur. (See References 1 and 2). The medial tendon is one of the tendons that connects to the pes anserinus tendon. If it is weak, extra stress is placed on the pes anserinus tendon, leading to tendinitis. The medial tendon on the inside of your knee gets stronger when you exercise the muscles around it. An effective way to do this is to perform the basketball squeeze exercise. Sit in a chair and place a basketball between your inner thighs above your knee. Press your knees and thighs together to squeeze the ball. Your doctor can advise you on how long to do this exercise. Switch from high- or even low-impact aerobics that jar your knee, such as swimming. The front crawl is the fastest and most popular stroke, and an effective workout if you have pes anserinus tendinitis that strengthens the tendon without strain. To do the crawl, you float face down and kick your legs behind you as one arm reaches forward, thumb down, and arches down through the water toward you as the other arm reaches backward. Each arm alternatively moves forward and back in a circular motion as you turn your head to breathe when your arm reaches behind you. Your knees bend slightly and your arms do most of the work. Weak hamstrings are unable to support your knee and more of the load is shifted to the tendons. Therefore, hamstring strengthening is part of treating pes anserinus tendinitis. To strengthen them, wear an ankle weight on your bad leg while lying your abdomen. Begin with your leg straight on the floor. 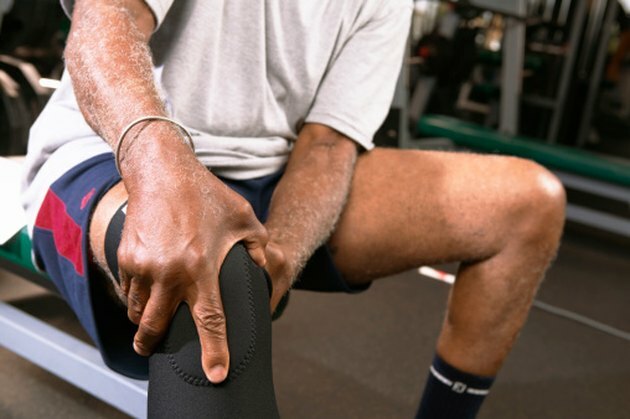 Flex your knee until you shin is perpendicular to the floor. Raise your leg toward the ceiling while keeping your knee bent. This is known as hip extension. You should feel your hamstring and glute contracting. Tight quadriceps make your hamstrings weaker. Even if you do hamstring exercises, tight quadriceps inhibit hamstring function, making more work for your tendons, including your pes anserinus. Stretch your quadriceps to relieve tension. Stand up and pull your ankle toward your buttocks to stretch the quadricep of your bent leg. Hold for 20 seconds and then switch sides.